Note: To find a doctor nearest you, please go to http://www.pacificchiro.com and choose the IUCCA logo or call USA 650-361-8908. WHAT DIFFERENTIATES APPLIED UPPER CERVICAL BIOMECHANICS (AUCB) FROM OTHER UPPER CERVICAL TECHNIQUES? From state-of-the-art neurophysiologic imaging and radiographic analysis to adjustive procedures, AUCB is unique when compared to other upper cervical techniques. Its foundation is built upon Dr. Palmer's 15 years of unprecedented research into the effects of upper cervical technique on the global physiology of the human body. Since that time, decades of clinical research and recent advances in diagnostic technology have caused an evolution in Dr. Palmer's procedures to form what we currently know as Applied Upper Cervical Biomechanics. For over 100 years the foundational premise of our profession has been that health and disease are nervous system dependent; and that the spinal adjustment restores the human nervous system to normal function. 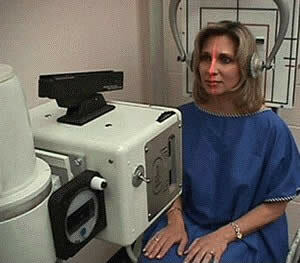 AUCB is the only upper cervical technique to maintain that objective neurophysiologic infrared imaging be used on every patient encounter both before and after an adjustment is rendered to substantiate this premise. Without an objective analysis of neurophysiology, it is impossible to determine if neuropathophysiology is present and if the adjustment has effectively restored normal nervous system function to the patient. The IUCCA was the first upper cervical association to incorporate peer-review research based normative data for the detection of abnormal neural function via paraspinal digital infrared imaging. We as a profession insist that we can improve nervous system function, those that practice AUCB can objectively prove it. To determine the adjustment listing capable of producing maximal neurologic benefits, AUCB uses a complex and unique form of upper cervical radiographic analysis. The entire cervical spine is analyzed arthrokinematically for aberrant function of the upper cervical articulations. This information is used to determine the precise line-of-drive for adjustment procedures to the first, second, or third cervical segments. 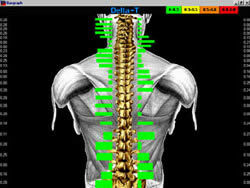 Adjustments based on this system of analysis have consistently produced full body neurophysiologic benefits on patients, which has been objectively substantiated by both high-resolution camera and paraspinal infrared imaging. The adjusting procedures used in AUCB are a modified form of that which was used by Dr. Palmer. Research performed on over 3,000 individual case radiographs has shown that a reliable C1 transverse process contact point can only be achieved in approximately 5% of patients. With this in mind, AUCB uses a specialized adjusting table that allows for a precise contact on the osseous spinal structures in the upper cervical spine. 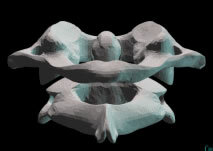 The design of the table also facilitates joint cavitation and full control over all line-of-drive vectors (Modern arthroscopic and cineradiographic research has demonstrated the need for both precise line-of-drive and cavitation to resolve intra-articular adhesions in order to restore normal arthrokinematics). Consequently, lateral C1 transverse process approaches, drop table use, and the inadequate force transference used in many upper cervical techniques has demonstrated significantly lower reliability in resolving objective signs of neuropathophysiology. The main objective of AUCB is to increase the predictability of clinical results, thus improving the percentage of patients that respond to care. The IUCCA is constantly striving, through continued research, to increase this percentage. As such, we are always open to any new form of care that can objectively demonstrate consistent improvements in neurophysiologic responses over what we currently observe clinically. As health care providers, we should all be continuously seeking ways to provide better care for our patients - salus populi est suprema lex. Radiology, otherwise known as x-ray imaging, has been an established method of evaluating bone structure for many years. It is often helpful in locating bone tumors, certain types of arthritis, fractures and other disorders. Nonetheless, other valuable information can be gleaned from these films as well. Analysis of spinal alignment can often yield critical information as to the source of a condition given the relationship between the spine and the human nervous system. Standard radiological equipment, however, introduces numerous errors that compromise the accuracy of the images when used for this purpose. When x-ray is generated, one portion of the beam is projected straight ahead and is called the central ray. The rest diverges from the center and spreads out in the shape of a cone. If the radiological unit is not properly aligned, or the patient is positioned incorrectly, the image will distort. For some conditions, this is not a problem. However, when evaluating the spine, distortion can change the relative position of the bony segments causing the appearance of false misalignments. This can produce disastrous effects when the information from the images is used as a basis for treatment. Precision radiology takes standard imaging to the next level. Unlike conventional equipment, precision radiology is meticulously adjusted for accuracy using laser technology and a specialized frame designed to maintain its alignment. 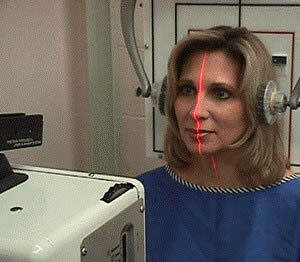 The patient is then positioned to the central ray using advanced laser system pioneered by the IUCCA, thus virtually eliminating image distortion. With clear accurate images to start, a precise analysis of each view can be made gleaning the most amount of information possible from this important diagnostic procedure. The clinical need to x-ray is determined on a case-by-case basis and is not a set policy of the IUCCA. Not every patient needs to be x-rayed. Every effort is made to keep x-ray exposure down to a minimum. This includes the use of specialized equipment that serves to reduce the amount of x-ray needed to produce an image when necessary. Paraspinal Digital Infrared Imaging confines the area of examination to the regions located directly next to the spine. 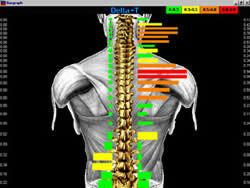 Objective signs of nervous system dysfunction will be detected in this area first if the cause is from the spine. The images also provide objective information to evaluate the effectiveness of treatment after it has been rendered. Given the critical role of the nervous system in health and disease, the IUCCA insists that paraspinal imaging be performed on each visit to monitor the response of the nervous system to treatment. A hand held unit is utilized instead of a camera for ease of use and to reduce the cost of the procedure for the patient. The protocols are identical to the camera studies with a few slight differences. In the case of a cervical spine (neck) examination, the acclimation occurs in the waiting room since no disrobing is required. Offices should be climate controlled to allow for this convenience. The patient simply loosens their collar and removes all jewelry from the neck. If the entire spine is to be imaged, then the patient will acclimate in a treatment room. With the patient seated, the doctor will move the paraspinal unit along the spinal region of interest. This information is then sent to a special computer for analysis. Measurements are compared with research established normal values to determine how well the nervous system is functioning. This examination takes approximately 5-10 seconds to complete making it very practical for daily use. Images are taken before and after treatment is rendered. By comparing these daily pre and post images, the effectiveness of care can be immediately determined. The effectiveness of a course of treatment can be judged by evaluating a series of images taken over a period of time. Infrared Image taken after treatment showing normalization of nervous system function. Following precision radiology, an analytical radiographic method of combined mensuration and arthrokinematics is used to determine if biomechanical abnormalities exist at the atlanto-occipital and atlanto-axial articulations. From the accumulated degree of aberrant biomechanics found at the upper cervical articulations, corrections can be determined. Before treatment is rendered, patients are advised that exacerbations in symptomatology might occur as part of the normal response to care due to the global impact of neural reintegration. In order to insure proper segmental contact and line-of-drive (LOD) control, the patient is placed on a specially designed knee-chest table with the posterior arch of his/her atlas as the contact point. An adjusting force is introduced using a specialized upper cervical adjusting procedure (1). The patient is then placed in a post-adjustment recuperation suite for 15 minutes as per thermographic protocol (2-4). Correction of the subluxation is determined by resolution of the patient’s presenting neuropathophysiology on the post-adjustment paraspinal infrared scans. 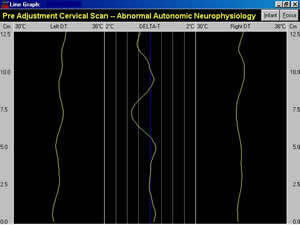 All subsequent office visits include an initial cervical paraspinal scan, and if care is rendered another scan is performed to determine if normal neurophysiology was restored (Fig. Opp.). Since the patient’s care is focused in the upper cervical spine, only cervical paraspinal infrared scans are taken during normal treatment visits with full spine paraspinal scans performed at 30-day re-evaluation intervals. The single most important factor in the management of these cases is our ability to objectively monitor the adjustment’s affects on the patient’s neurophysiology. Many different examinations for “subluxation abnormalities” are used in our profession such as leg length, cervical challenge, motion and static palpation, and others. However, these tests lack objectivity, possess inherent errors, and have no confirmation of their ability to monitor neurophysiology (5-8). Infrared imaging, however, has been researched for over 30 years compiling almost 9,000 peer-reviewed and indexed studies confirming its use as an objective measure of neurophysiology. By using this technology, our method of upper cervical care has been able to consistently produce reproducible and dramatic positive neurophysiologic improvements in our patients. 1. Amalu, W., Tiscareno, L., et al. Precision Multivector Adjusting: Module 3 and 7 -- Applied Upper Cervical Biomechanics Course. International Upper Cervical Chiropractic Association, 1993. Thermography Protocols - International Thermographic Society 1997. Thermography Protocols - American Academy of Thermology 1984. Thermography Protocols - American Academy of Medical Infrared Imaging 1997.